But that’s just an average, and sometimes averages can deceive. Turning several observations into a single metric like a Total Quarterback Rating (QBR) obscures some information. For example, post-2006 Brett Favre2 (average QBR: 52.1) and Andy Dalton (52.0) have roughly identical numbers, but would anyone think of Favre when thinking of Dalton? 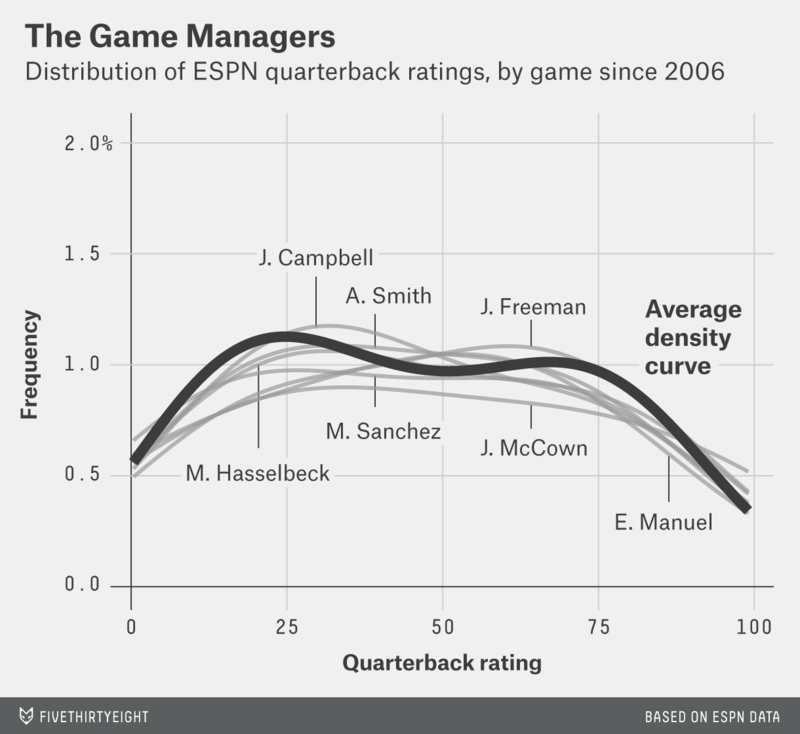 Each quarterback is given his own density curve, which represents the distribution of game-by-game QBR. 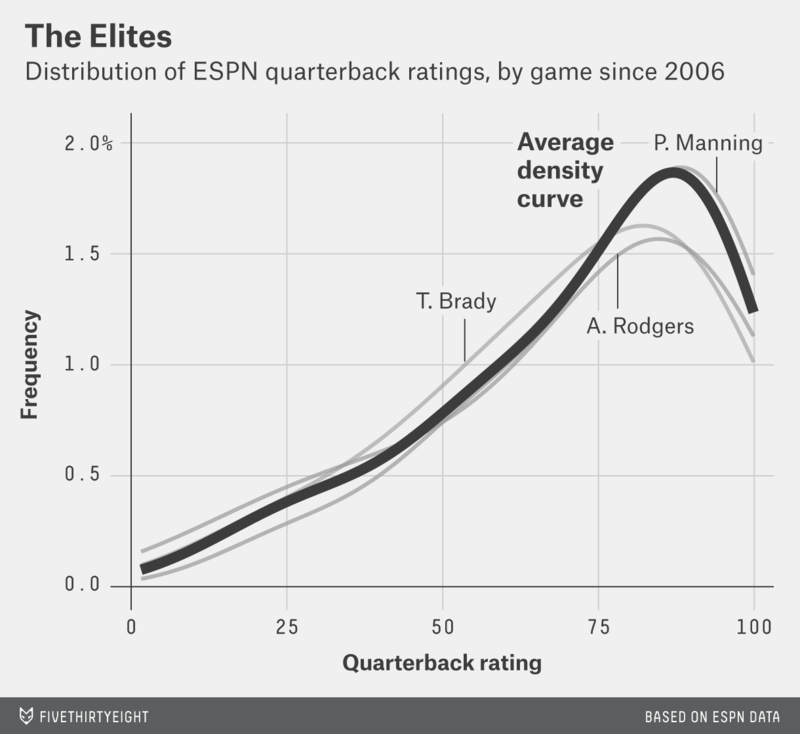 The dark black curve in each figure represents the average density for all quarterbacks in that group. 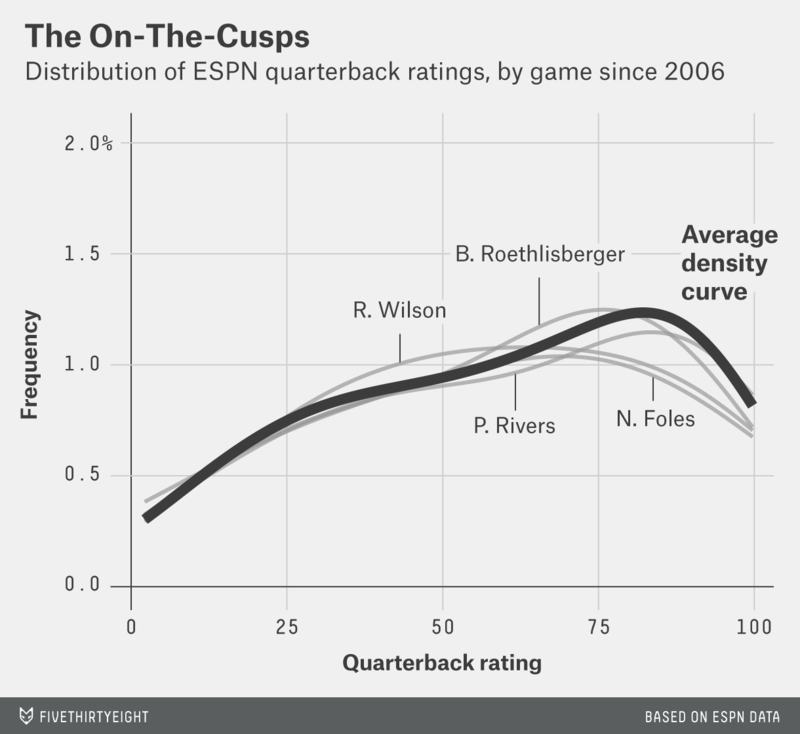 The groups are designed such that quarterbacks within the same group are similar, but from one group to the next, there are differences in the centers, shapes and/or spreads of each quarterback’s density curves. Some groupings weren’t a surprise. Brady, Rodgers and Peyton Manning — widely considered the three best quarterbacks in the NFL and the trio ranked Nos. 1, 2 and 3 in average QBR — make up one group with a curve that spikes dramatically as QBR rises. Other groupings, however, offered some counterintuitive results. One cohort consists of five players: Luck, Colin Kaepernick, Matt Schaub, Teddy Bridgewater and Tony Romo. Each quarterback in this group had more bad games and fewer exceptional ones than the Brady/Manning/Rodgers set, but he posted more strong games than poor ones over his career. This would suggest that if you’re going to call one of these quarterbacks “elite,” you need to at least consider that all of them are or were. 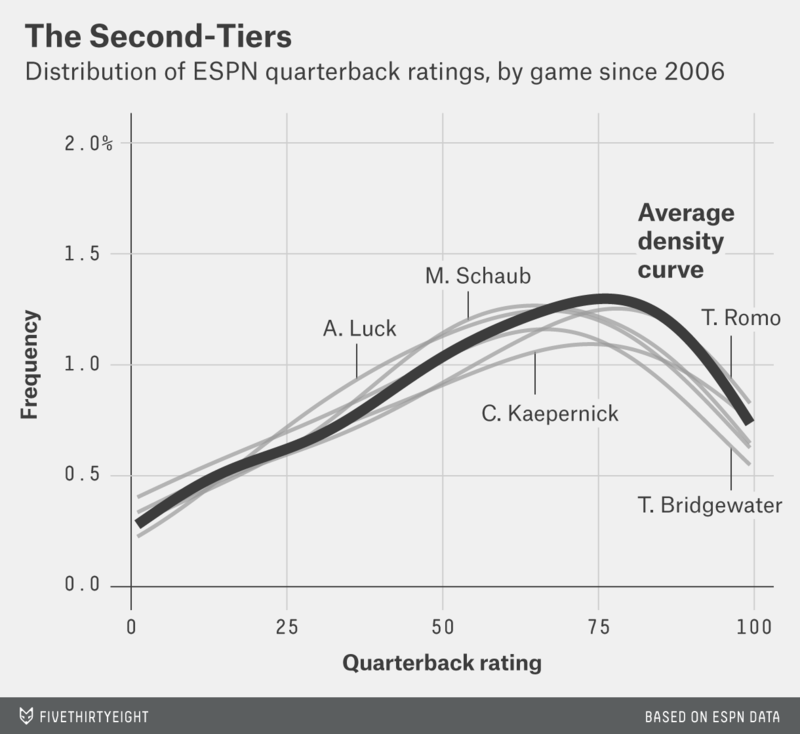 Even though the narrative around Kaepernick, Schaub and Romo is that they’re inconsistent, their curves suggest otherwise. That cohort has a similar number of great games but also a large bump around QBR 20, which are bad games by any measure — a bump that the Luck group avoids. Not surprisingly, the Luck group has a career win percentage of 59 percent, while the former cohort is only 53 percent. In the NFL, interceptions (a key component of a low QBR score) can drag a team, and a QBR, down. Now compare both of those groupings to the one with Ben Roethlisberger, Nick Foles, Philip Rivers and Russell Wilson. They, too, have a bump around QBR 25, but their peak checks in somewhere around a QBR of 85 — a score that gives a team a very good chance to win. That elevated number would explain why the group’s 64 percent win percentage is the highest of the three groups previously mentioned. The occasional bad game won’t break a quarterback as long as his good performances are strong enough. Other quarterbacks might not like their company. Alex Smith chafes at the idea that he’s a “game manager,” and talent scout Russ Lande thinks he might not be. “Smith is often referred to as [a game manager], but physically, he doesn’t limit you,” he says. “You don’t have to make him a game manager. I think it’s just that some quarterbacks have that philosophy, ‘I’m never going to throw it where it’s a risk.’ It’s more based on their mentality than their physical skill set.” And yet the stats group Smith with E.J. Manuel, Jason Campbell, Josh Freeman, Josh McCown, Matt Hasselbeck and Mark Sanchez. Among that company, perhaps game manager is a generous term. One of the most interesting groups involves a player who is no longer in the league. Favre’s games after 2006 landed in the same cohort as post-2006 Michael Vick and Vince Young, two quarterbacks known for making plays with their feet and not much else. We can explain this by breaking down Favre against Dalton. Although their average QBR is nearly identical, the vast majority of Dalton’s games fall between a QBR of 25 and 75. Favre, the ultimate freelancer, has a big bump around 15 QBR and another between 80 and 85. Dalton won’t win a team the game, but he probably won’t lose it. Favre, however, is likely to do either. Rivers and Luck offer similar stories. Their career QBRs — 61.5 and 60.8, respectively — aren’t quite Manning’s 76.1 or Brady’s 70.1, but they are good enough to rank the pair in the top 10 of quarterbacks whom we examined. Both can make all the throws and post huge numbers, but there’s a general perception that Luck — a Stanford graduate who has the reputation of being a football savant — makes fewer mistakes. We see this in their game curves. Luck has fewer bad games but fewer truly exceptional ones as well, while Rivers has more bad games and great ones, with less middle ground. This season’s playoff picture provides a look at one possible future. Whereas Rivers watched from home, Luck led the Indianapolis Colts to a win over Dalton and the Cincinnati Bengals, then an upset over Peyton Manning and the Denver Broncos. He didn’t win the games with his play, but more importantly, he didn’t lose them. In other words, a team might not need a quarterback with a huge bump on the right side of the graph to prevail in the NFL, but one with a peak on the left probably dooms it to failure. We made an interactive tool with all the quarterback curves. Click here to graph density curves of your choosing, and look at the splits for home and away games. There’s a larger sample size of QBs in the interactive, which means players like JaMarcus Russell are involved. Because who doesn’t want to find out which QBs are most similar to JaMarcus Russell? CORRECTION (Jan. 16, 1:46 p.m.): A previous version of this article misstated Rivers’ and Luck’s career QBRs. ESPN’s QBR, measured on a scale from 0 to 100, debuted in 2006. It’s not retrofitted to quarterback performances before 2006. Quarterbacks who post a single-game QBR above 90 in a game win 90 percent of the time, whereas a score of less than 10 corresponds with a loss more than nine times out of 10. For a description of density curves and its application to hockey players, see this post on the blog WAR on Ice. 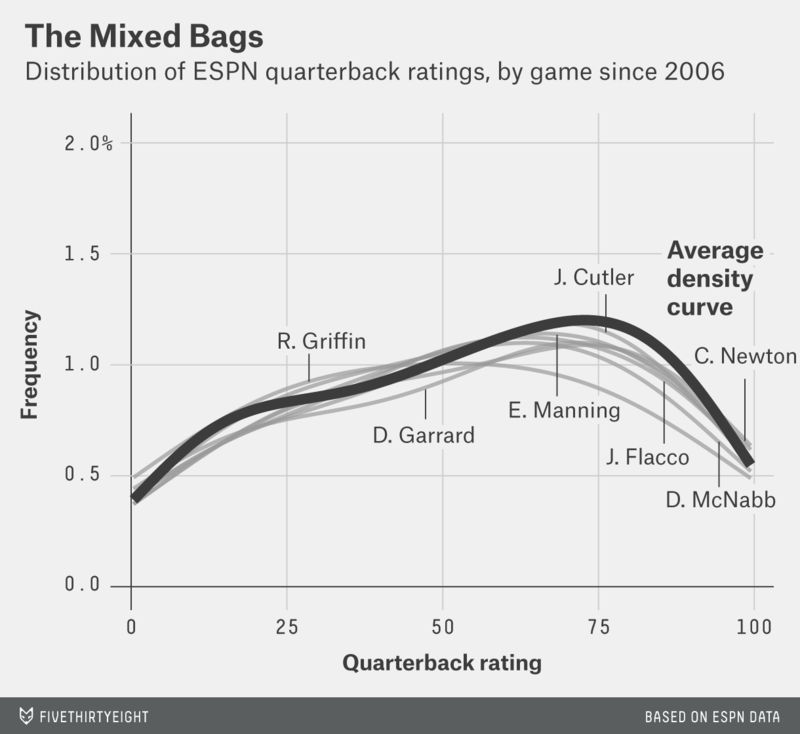 We used k-means clustering on different percentiles of each quarterback’s distribution. Although there is no correct value for k in implementing k-means, we found the best performance with between k=8 and k=10. As the curves looked much easier to interpret with k=10, we went with that. Once we had fixed 10 clusters, we ran the algorithm about a dozen times and used the clustering with the highest within-cluster similarity of those iterations. This helps justify the choice of player groups but doesn’t exactly imply that the QB groups are perfectly stable from one iteration to the next. That is because the k-means algorithm is non-deterministic — it doesn’t give the same answer with each run. Given that company, would you want to pay Flacco’s $120.6 million contract? Favre threw 336 career interceptions, well ahead of second-place George Blanda’s 277.